On 21 Jan 2015, the All Party Parliamentary Group on weapons and the protection of civilians (which Article 36 provides secretariat support to) held a roundtable briefing on December 2014’s Vienna Conference on the Humanitarian Impact of Nuclear Weapons. The meeting was chaired by Martin Caton MP (Labour). There were briefings from Dame Joan Ruddock MP (Labour) and Thomas Nash (Article 36 and International Campaign to Abolish Nuclear Weapons, ICAN) as well as Sir Nick Harvey MP (LibDem). Thomas Nash discussed the encouraging developments at Vienna, including the Austrian MFA’s pledge to work to “fill the legal gap for the prohibition and elimination of nuclear weapons” and “to cooperate with all stakeholders to achieve this goal”. Austria has now sent out a diplomatic invitation (note verbale) to other countries to sign up to the pledge. The pledge also acknowledges the rights and needs of victims, which has particular implications for the UK. It provides a strong advocacy tool for parliamentarians around the world, and could provide a starting point for a diplomatic process. In the UK, Nash suggested that work should be done to challenge opposition to a ban treaty process, and observed that the existence of such a process provides a strong argument for deferring Trident renewal. 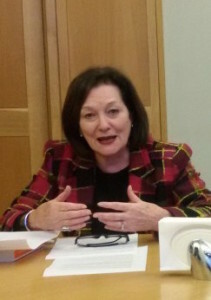 Dame Joan Ruddock MP praised the ICAN civil society forum held prior to the government meeting in Vienna, at which she was a speaker, and observed that “all the testimonies and evidence at the Vienna Conference add up to a devastating scenario of humanitarian crisis that nobody can imagine” should nuclear weapons ever be used. Discussion ensued on how a treaty banning nuclear weapons could be achieved following Austria’s pledge, and what such a treaty’s relationship would be with existing disarmament obligations such as those in the Nuclear Non-Profileration Treaty. Martin Caton MP highlighted the precedents for a ban treaty process of treaties on anti-personnel landmines and cluster munitions, which both began as civil society campaigns. It was also pointed out that a treaty banning nuclear weapons supports rather than undermines the objectives of existing legal instruments, and would help create conditions for both disarmament and non-proliferation. For a full record of contributions to the discussion, see this post on ICAN UK’s website. See our press release on the Austrian pledge.